The Heritage Carousel is a recent recipient of a Polk County Betterment Grant. Thanks to Polk County Supervisor Tom Hockensmith, the Carousel received $5,000 for a major improvement project. The current display/sales counter, which is an old cosmetics counter donated many years ago by a local department store, will be replaced with a brand new, custom made counter. The new counter will better serve the needs of our customers. It will have a storage and display space as well as a dedicated sales counter. It will be larger, allowing us to declutter our space and have more room for our rental clients. The counter is slated to be completed in late August and installed later this fall. 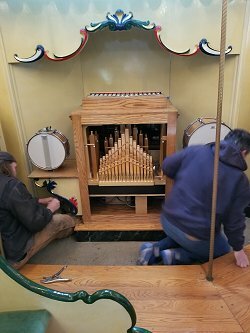 July 14, 2018 - Band Organ Gets Upgrade!! 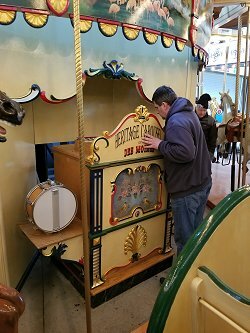 The Stinson Band organ at the Heritage Carousel recently got an upgrade. A 46/key MIDI interface system was added to provide more music options and to extend the life of the organ. 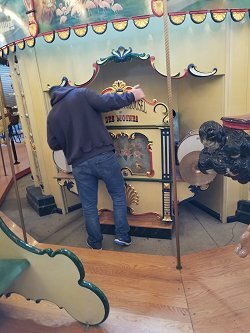 The Stinson Band Organ was built specifically for this Carousel. It plays by forcing air through a pneumatics system which makes the instruments play. The MIDI system replaces the paper rolls which were often affected by the heat, humidity, and temperature fluctuations of the Iowa climate. Being exposed to wind and dirt also takes a toll on the organ and the paper rolls. With regular maintenance, the life of the organ has now been extended. You will notice, also, that the music sounds a little different. We have repaired the drums and the glockenspiel and have purchased a multitude of new songs. The MIDI system was purchased with the donations from many of our generous supporters. Thanks to them, we are able to keep the carousel maintained and updated while keeping the cost of a ride for kids at 50 cents. 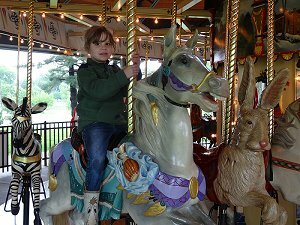 Consider making a tax-deductible donation to the Carousel today! November 2012 - The Animals Are Looking Good! Local artist keeping the Carousel fresh! August 26, 2012 - 2012 "Cruise to the Carousel" has another records breaking show! The 2012 Cruise to the Carousel had another record breaking show in 2013, with 188 registered cars. The Rollin’ Relics car club gave a donation of $7,000 to the Des Moines Carousel Foundation in November. 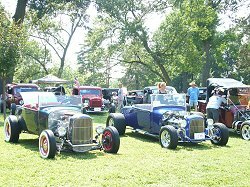 The car club has held the car show in Union Park for 12 years. The show continues to get better and more popular each year. Thank you to the many club members who organize, arrange for donations, coordinate cars, food and the schedule. 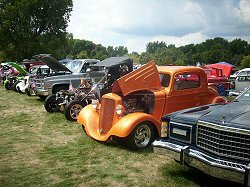 Click here to view the Rollin' Relics Car Show page! Thanks to all who came out on the VERY warm evening to celebrate! Thanks to Fareway Stores on Euclid for the lemonade to keep us cool! Click here to view the video from WHO-TV. 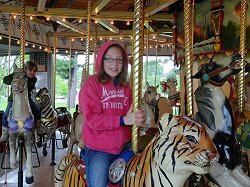 January 7, 2012 - First Time Ever - The Carousel Opened for Rides Today with over 1000 rides given! Click here to view photos from the day. Congratulations and THANK YOU to the Rollin’ Relics Car Club Members for the outstanding show! The park was full of cars and viewers, the Carousel was full of riders, the sun was shining! Thanks for the biggest show ever and thanks for your support of the Carousel. 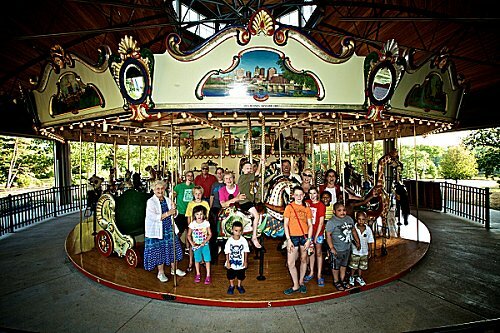 The Club is the largest annual supporter of the Heritage Carousel! 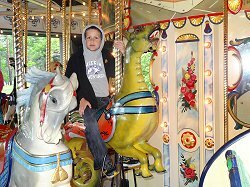 The Carousel receives a grant for “Carousel Creation.” The grant is a collaboration of efforts with local artist, Sandy Gustafson and the New Directions Shelter program / Hawthorn Hill and the Carousel. The grant provided funding to develop the concept of “community art” through the creation of a permanent piece of art which will be on display at the Carousel this summer. 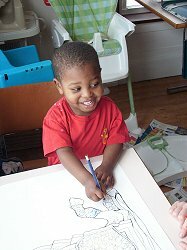 Children, parents and staff at the shelter all contributed to the piece of art. An interview with the artist doing the restorative painting at the Carousel will be shown this Sunday, November 15, 2009 between 7:30 - 8 a.m Mollie Cooney, KCCI Ch8, interviewed Sandra Gustafson, local artist as she worked at the Carousel last week. Sandy has completed work on six animals on the Carousel this fall and we hope to bring her back each year to keep the Carousel beautiful. Using her talent along with long-distance input from Carousel Works, who built the Carousel, Sandy is working to restore the original look of the animals and put a protective clear coat on them. The Des Moines Carousel Foundation was able to hire Sandy to do this work through funding provided by the Principal Foundation. Click here to view the KCCI video!